Multimedia tablet Nexus 7 has been so popular that Google is not calculated demand and temporarily stopped taking orders in the Google Play, reports Guardian. And the deficit has arisen only in one model, which, according to the source, Internet-based Company did not expect. 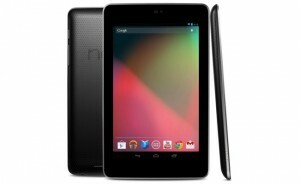 As reported Google Nexus 7 16GB model is receiving most preorders. It is an older model of the Nexus 7 and there was a shortage, although Google has counted on the amount of local disk space for users will not be very important. After all, everything you need can be stored in the cloud, and preference will be given to cheaper 8-gigabyte model. As shown, the user still important to have more local disk space, and they are willing to pay for it. Especially in the Google Nexus 7 tablet features to increase its volume with a memory card no. Recall that in the cost of 8 – and 16-gigabyte model Nexus 7 is $ 200 and $ 250 respectively and in the UK – £ 159 and £ 199. At this time, Google has not commented on the situation with the deficit. Whatever it shows Nexus 7 is in an extreme demand.